Olaf Carl Seltzer was a painter well known for his landscape paintings. At a young age, Seltzer showed talent in painting and enrolled in Danish Art School and Polytechnic Institute. However, a couple years after enrolling, his father died, and the family moved to Great Falls, Montana. Here he worked as a cowboy, painting and sketches the whole time. His most famous works are of the Native Americans, ranchers, or wildlife depicted in the natural countryside of Montana. 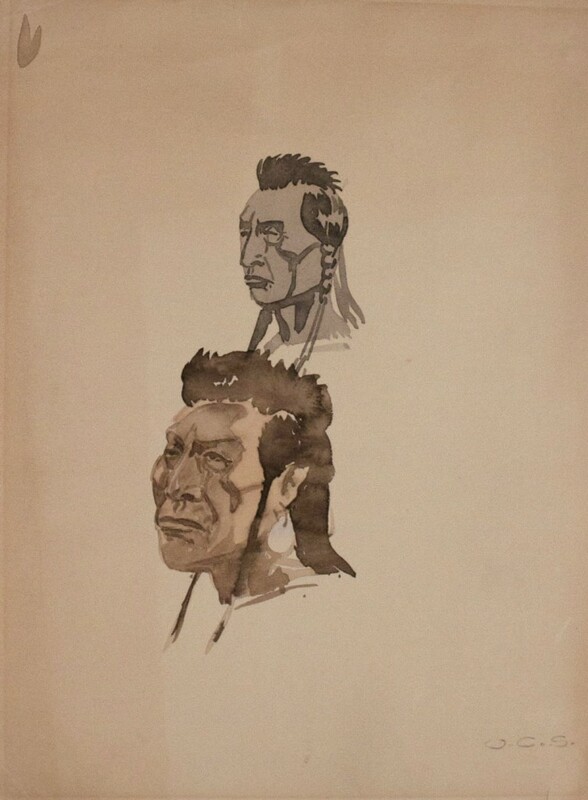 However, St. Olaf College Flaten Art Museum archives own a work by Olaf Carl Seltzer entitled Native American Portrait Study. This work, instead of portraying a whole landscape, only shows two Native American heads, one in the the foreground and one in the background. The head in the foreground is painted in shades of brown and the head in the background is in shades of grey. Many of Olaf Carl Seltzer’s works containing Native Americans do not depict them in action, hunting or perhaps fishing. Usual the Native American people are riding on horses, pausing at a creek or thoughtfully looking ahead. The same goes for his Native American Portrait Study; the two men are looking off into the distance. I believe Seltzer thought of the Native American’s and poised, reverent people. Unfortunately, there is not date to this portrait, but around Seltzer’s lifetime, many thought of the Native American’s as savage people. However, I believe that Olaf Carl Seltzer’s background, moving from Copenhagen to Montana, had a significant effect on how Carl viewed these people. This entry was posted in Luke Simonson by simonson. Bookmark the permalink.